【MASTER】57mm Single Aluminum Torlon(PAI) Bearing Block – Superyachts News, Luxury Yachts, Charter & Yachts for Sale. The new Poseidon Aluminum Roller Bearing Block is made of Hardkote-Anodized Aluminum plates and Aluminum sheave for strong and durable performance. These blocks feature Torlon® roller bearing and second race Derlin® ball bearing for smooth rotation and low friction under maximum loads. 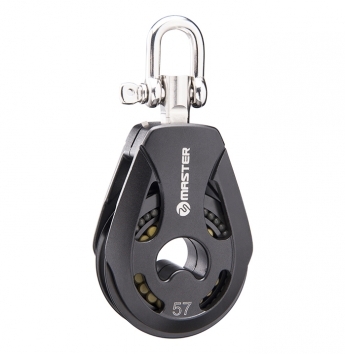 Patented lock-up swivel shackle can be locked either of two directions or just free to swivel. Blocks can be easily disassembled with hex wrench for maintenance. Torlon® is the trademark of Solvay Advanced Polymers.